Bob Dylan is a performing artist—a traveling bluesman, a modern-day minstrel—and the best way to try to access his art is to see him perform live. Reading the lyrics, even listening to the records just does not do the man justice. 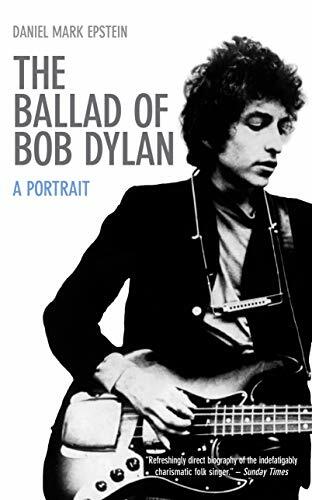 In The Ballad of Bob Dylan, Daniel Mark Epstein does what few have been able to do at all, much less this well: capture that spirit, and in so doing, somehow manage to get closer to the essence of an American icon. Mr. Epstein explores Mr. Dylan through the lens of four concerts spanning 46 (yes, you read it correctly, 46!) years. Beginning with the Lisner Auditorium in Washington, D.C., December 14, 1963, moving to Madison Square Garden, 1974, then to Tanglewood, 1997, and, finally, ending with Aberdeen, 2009, the author invites the reader into the endless iterations and reincarnations of the man who, by Dylan’s account (not the author’s) “doesn’t do folk-rock” and is “just a guitar-player.” Mr. Epstein tells of a Hibbing, Minnesota, Jewish boy obsessed with American roots music. He explores the inner workings of a young man who locks himself in his room listening to far away radio stations—a teenager enamored with Little Richard and Buddy Holly. Mr. Epstein takes the reader on an improbable journey in which this same person, later in his life, converts to Christianity, and, for nearly three years from 1979–1981, almost exclusively performs music from his three religious albums, regularly using the stage as a pulpit. Mr. Epstein describes a man so distraught that in 1987, after years of going through the motions and hiding behind back-up singers, concludes retirement from live performance is the only option. To truly comprehend how disenfranchised Dylan must have been, these years included commercially successful tours with heavyweights Tom Petty and the Heartbreakers and The Grateful Dead. This moment is likely the birth of what has become known as “The Never Ending Tour,” a tour that Dylan claims has ended, but to which the author refers in an effort to describe Dylan’s continual need to perform well over 100 shows per year. Mr. Epstein cites Tanglewood as the 880th show of the tour. Specifics aside, Dylan has kept up this pace ever since. Dylan has played in front of a couple thousand people or less; he has played to sold out arenas; he has played summer shows in amphitheaters to crowds of 20,000-plus; he has played ballparks and college campuses; he has played in front of crowds that have enthusiastically embraced him, as well as several who have walked out on him. But keep playing he has. Moving from concert to concert, Mr. Epstein recounts various stages of Dylan’s career. A great many of these stories can be found elsewhere; however, the perspective is unique, and there is ample interesting new ground. The best example of this is the 34 pages of Chapter 12, in which the author goes to great lengths describing the impact drummer David Kemper had on the band during his 509 shows ranging from 1996–2001. It is probably no coincidence that this is the era in which Dylan reconnected with the masses. Another interesting tidbit is Mr. Epstein’s account of when Larry Campbell replaced John Jackson on lead guitar about the same time. Campbell later moved over and played multiple instruments when Charlie Sexton replaced Bucky Baxter in 1999. Upon arrival, Campbell had to learn Dylan’s songbook, yet during the rehearsals prior to his first tour, the band almost exclusively played covers from the traditional American songbook. In fact, rarely during sound checks did they ever rehearse anything from that night’s set list. Dylan wanted things raw and spontaneous and created an environment to ensure it. There are a great many other nuggets in this book, and Mr. Epstein’s unique ability to capture the essence of Dylan’s commitment to performing live is unique. Paul Williams wrote three books entitled Bob Dylan Performing Artist, which consider work from different eras of Dylan’s career, but Mr. Epstein, for reasons that will become apparent to the reader, does a better job than most at providing the context of why this discussion is worth having in the first place.